- Publisher For the first time ever on DVD, Golden Books Music presents Psalty! Your Kids and Grandkids will love these classic titles as much as you did. Psalty and Golden Books Music... Music Kids Love From a Company Parents Trust. 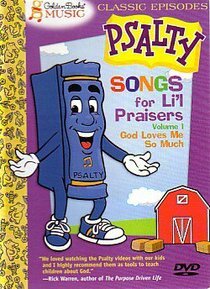 About "Psalty's Songs For Lil' Praisers Volume 1"
For the first time ever on DVD, Golden Books Music presents Psalty! Your Kids and Grandkids will love these classic titles as much as you did. Psalty and Golden Books Music... Music Kids Love From a Company Parents Trust.